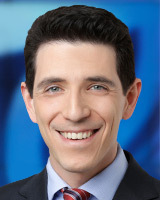 Josh Einiger joined the Eyewitness News Team as a Reporter in September 2009. Since then, Josh has taken the lead on major stories of national interest, including the ongoing search for a serial killer near Gilgo Beach and the massacre of four people at a pharmacy in Medford. He also covered the Times Square bombing attempt and the arrest of financier Dominique Strauss-Kahn. From politics to plane crashes, Space Shuttle launches to hurricanes, Josh has traveled the country reporting the news. Prior to joining the Eyewitness News Team, he was a national correspondent for Fox News affiliates, covering such landmark stories as the death of Michael Jackson in California and the healthcare debate in Washington. As a reporter for WTXF-TV Philadelphia, he won a coveted Edward R. Murrow award for his series focusing on the global recession and its effect on everyday people. Josh also worked as a reporter at WFTV in Orlando and at WNYT-TV in Albany. Prior to that, he was an assignment editor at KYW-TV in Philadelphia. He launched his career as a photographer and field producer at NY1 News in New York City. Born and raised in Manhattan, Josh graduated from the University of Pennsylvania, where he majored in Political Science and History. He is a member of the Radio Television News Directors' Association. Josh has been nominated for numerous regional Emmy Awards and was voted one of Central Florida's best reporters by readers of Orlando Magazine. He is an avid photographer and world traveler. It's a neighborhood watch like no other. A Queens community is cleaning up one giant mess. A Brooklyn parking garage lift failed - dropping one parked vehicle onto another car below - damaging both. There is a ton of anger in public housing - anger directed at Mayor Bill de Blasio, the Federal government, and at the bureaucrats who run NYCHA. Areas to the north and west of New York City were hit hardest by the storm that moved through the area overnight, which will then be followed by bone chilling temperatures and a deep freeze that could make for treacherous travel conditions.